The first of Pictures On Walls two Dran shows 'My Everyday Life' opened last week alongside their christmas pop-up shop Marks&Stencils. 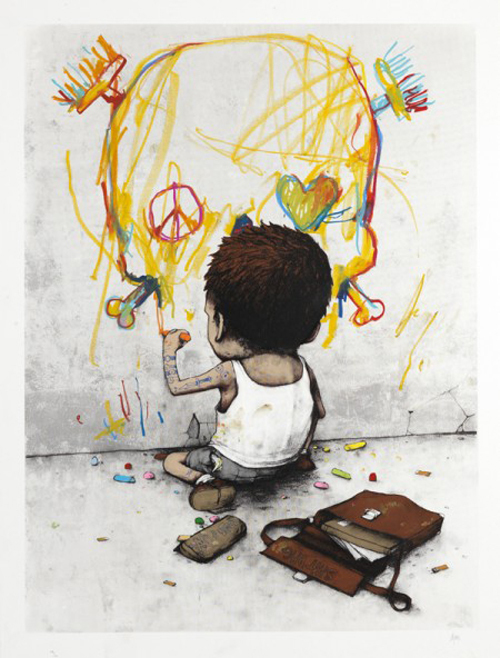 The show saw Dran take over the lower floor space and transform it with sculptural installations, paintings and street art. The installation’s main character is Scribouille, a homeless puppet whose life is devoted to nothing but creating art. Dran has used the space to create a studio space that one would image Scribouille using to create his art with workspaces, tools, miniature sowing machine and silk screens for printing. All the usual stuff you might expect to find in an artists space but in miniature. The whole space has also been filled with original works from Dran and with so much to take in the show warrants multiple visits to take it the volume of work on display. We will be paying the show a second visit tomorrow and imagine it won't be our last visit to the show before if closes. great exhibit! thanks for the heads up!